Calcaneal osteosarcoma is a rare entity, which presents with chronic heel pain and swelling and often clinically misdiagnosed as a traumatic or inflammatory process. The diagnostic confusion is because of the rarity of this entity and unawareness of such rare areas of affection of osteosarcoma. This usually leads to delayed diagnosis and treatment and may severely affect the prognosis. 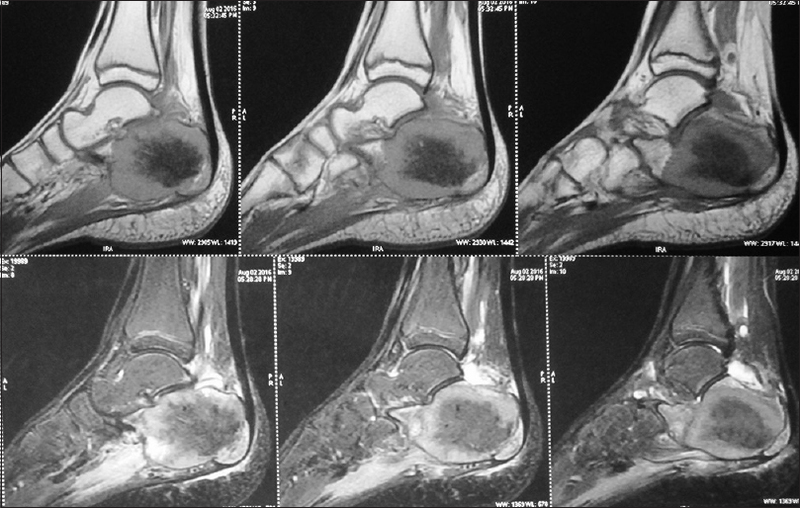 We present a rare case of osteosarcoma involving calcaneus in a 10-year-old female who presented with long-standing left heel pain and swelling where the diagnosis of a sinister underlying bone lesion was delayed. Osteosarcoma is an osteogenic tumor of bone characterized by the production of neoplastic osteoid tissue. It is the second most common primary malignant tumor of bone after plasmacytoma and is the most common primary nonhematopoietic malignant tumor of bone in children and adolescents., It most commonly occurs in the metaphysis of long bones. It has a predilection toward distal femur, proximal tibia, and proximal humerus. Involvement of pelvic bones, clavicle, scapula, skull, jaw bones, and small bones of hand and feet is rare. Calcaneum is one of the rare sites of predilection for osteosarcoma. They usually present with heel pain and swelling and are often misdiagnosed clinically as traumatic/inflammatory process. 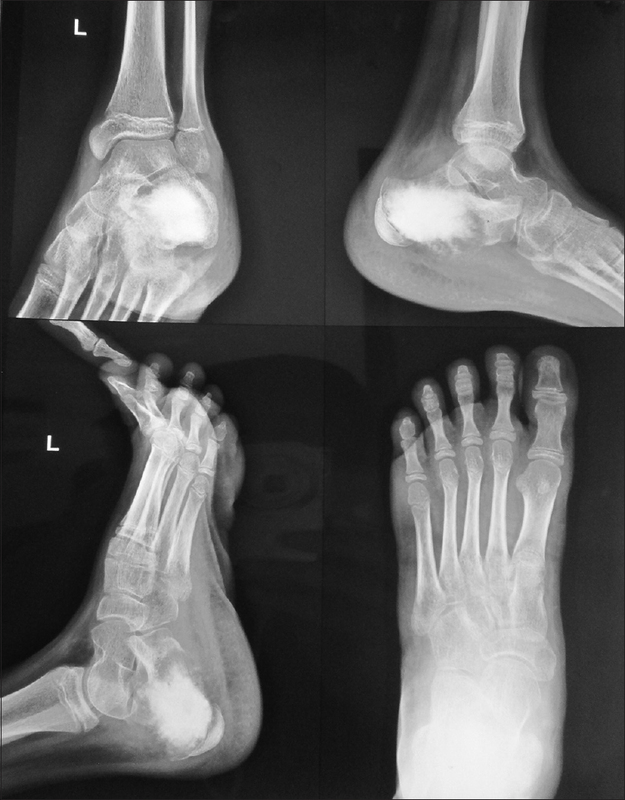 A 10-year-old female child presented with a complaint of pain in the left heel and foot for 6 months which was insidious in onset and gradually progressive. She had difficulty in walking for the past 3 months owing to pain in the foot. There was no history of fever, clinically significant trauma, or swelling. On local examination, there were no obvious signs of inflammation such as redness, swelling, or local rise of temperature. As there was neither history of trauma nor signs of inflammation, she was prescribed analgesics for the nonspecific pain and advised for follow-up. She presented again after 3 months with same symptoms but for the presence of swelling this time. Her symptoms had disappeared with the analgesic usage within days only to recur after few weeks. She complained of a swelling which was insidious in onset and gradually increasing in size. Suspecting a graver underlying pathology, she was admitted for a detailed workup. Roentgenography of the left ankle revealed a dense sclerotic area in calcaneum with radiating spicules [Figure 1]. Noncontrast computed tomography (CT) scan of the left ankle demonstrated a sclerotic lesion in the calcaneum with sunburst appearance and cortical breach [Figure 2]. Magnetic resonance imaging (MRI) of the left ankle showed a low signal intensity lesion located in the calcaneal body with characteristic of osteoid matrix [Figure 3]. Tru-cut biopsy from the lesion done and histopathology showed malignant cells having large nuclei and prominent nucleoli and osteoid matrix which are the histopathological hallmark of osteogenic sarcoma [Figure 4]. 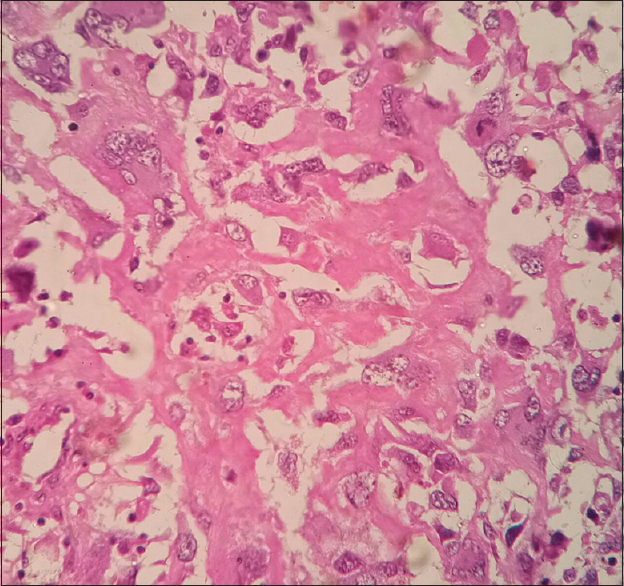 Further workup showed no distant metastasis. She underwent below knee amputation and completed four cycles of adjuvant chemotherapy with cisplatin, doxorubicin, and methotrexate. At present, the patient is with no evidence of recurrence or distant metastasis at the 10-month follow-up. There are two categories of osteosarcoma, primary and secondary. Primary osteosarcoma occurs de novo and usually affects the adolescents. Secondary osteosarcoma usually affects the older age group and occurs in abnormal bones such as bones affected with Paget's disease, chronic osteomyelitis, infarcts, fibrous dysplasia, radiation therapy, and some benign bone tumors. The WHO classification of osteosarcoma includes conventional, telangiectatic, small cell, low-grade central, secondary, parosteal, periosteal, high-grade surface types. Conventional osteosarcomas are the most common and include three subtypes, namely, osteoblastic, chondroblastic, and fibroblastic. Treatment, prognosis, and survival rates depend on the subtypes, extent, and spread of the neoplasm. Therefore, both imaging and histopathology play a major role in the management of these patients. Osteosarcomas of foot are very rare accounting for 0.2%–2% of cases, and calcaneum is the most favored site among bones of the foot. Osteosarcoma is the most common malignant bone tumor of calcaneum followed by Ewing's sarcoma and chondrosarcoma. Calcaneal osteosarcomas have been reported to occur mostly in adults, more likely low-grade and better prognosis. However, high-grade varieties are as aggressive as other osteosarcomas. Calcaneal osteosarcoma usually has a nonspecific presentation such as pain and tenderness in the heel. Swelling can also be one of the presentations. However, these symptoms are usually misdiagnosed clinically as traumatic or inflammatory processes and are managed empirically with analgesics. Sometimes, there may be an improvement in the symptoms causing more dilemma and delay in the diagnosis. Recurrence or persistence of the symptoms or progressive increase in the size of the swelling should alert the clinician about something more menacing. The duration of symptoms until diagnosis of osteosarcoma in the foot ranged from 1 to 48 months. This crucial time can be saved by developing a keen intuition of malignancy in such patients. Similar symptoms can be caused by conditions such as calcaneal apophysitis, fracture, ligament injury, and plantar fasciitis and benign tumors such as unicameral bone cyst, aneurysmal bone cyst, nonossifying fibroma, osteoid osteoma, and osteoblastoma. Osteoblastic type is the most common type of calcaneal osteosarcoma. Other subtypes of conventional, low-grade central, telangiectatic, periosteal, and small cell have been reported. Radiographic features differ with the type of osteosarcomas. Osteoblastic type features sclerotic mass with ill-defined borders, exuberant periosteal reaction, and soft-tissue mineralization. A mixed tumor shows lytic areas in addition to above findings. Telangiectatic osteosarcomas present as osteolytic fluid-filled cystic lesions mimicking aneurysmal bone cyst. 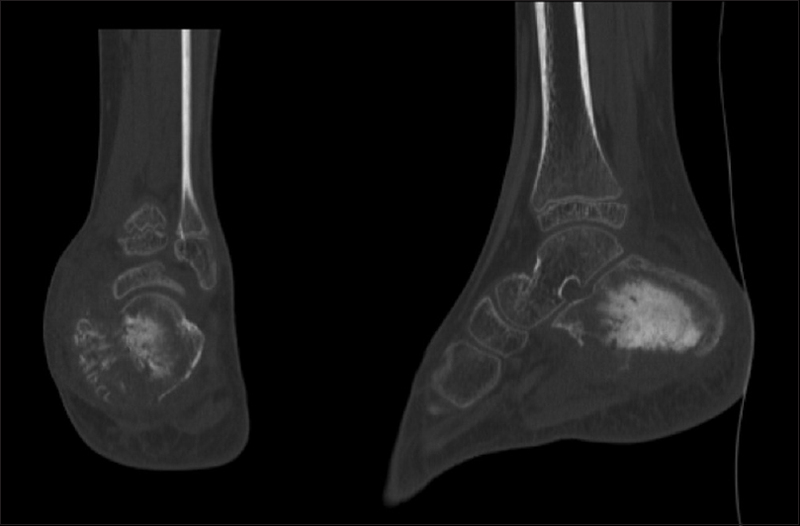 Both CT scan and MRI are important in the evaluation of calcaneal osteosarcoma. As the boundaries in the foot are not distinct, extension into adjacent compartments is common, which is best evaluated with MRI. However, the MRI findings are nonspecific for the diagnosis and are useful only for the staging of the tumor. CT scan is important to look for cortical breach and extra-compartmental calcifications. Imaging of the thorax and abdomen is important to look for metastatic lesions as it is a highly metastasizing tumor. Diagnosis is best done by open biopsy. Although it has a risk of tumor spillage, hemorrhage, and infection, it has better diagnostic accuracy than core biopsy. The presence of neoplastic osteoid and woven bone is diagnostic of osteosarcoma. The treatment of calcaneal osteosarcoma depends on the stage of disease and includes chemotherapy and surgery. Below-knee amputation is the most commonly used and satisfactory treatment with low recurrence rates. Limb salvage surgery has been reported only in a few cases. Because of poor compartmentalization of foot, radical oncological margins are difficult to achieve without below-knee amputation. With the advent of neoadjuvant and adjuvant chemotherapy, survival rates have increased. Calcaneal osteosarcoma is a rare cause of chronic heel pain in pediatric age group and should be considered as one of the differentials. A delay in the diagnosis has a deleterious effect on the prognosis of osteosarcoma. Insignificant history of injury, persistence or recurrence of pain and tenderness, and gradual increase in the size of the swelling should be carefully handled to rule out malignancy. We would like to thank Dr. Nihar Ranjan Mishra, Department of Orthopaedics, SCB Medical College and Hospital, for patient management. We would also like to thank the patient's parents for their cooperation. Mirabello L, Troisi RJ, Savage SA. Osteosarcoma incidence and survival rates from 1973 to 2004: Data from the surveillance, epidemiology, and end results program. Cancer 2009;115:1531-43. Pattnaik K, Pradhan P, Kar A, Burma S, Panda S. Unusual histological variants and a rare bone involvement of osteosarcoma in a referral hospital. Oncol J India 2017;1:2-6. Samal BP, Nayak C, Pradhan S, Sahoo TK, Jena AK, Pradhan S. Calcaneal osteosarcoma, a challenge for diagnosis: A rare case report and literature review. Oncol Discov 2015;3:2. Dorfman D, Czerniak B, Kotz R, Vanel D, Park YK, Unni KK. World Health Organization classification of tumours, osteogenic tumors. In: Fletcher CD, Unni KK, Mertens F, editors. Pathology and Genetics of Tumors of Soft Tissue and Bone. Lyon, France: IARC Press International Agency for Research on Cancer (IARC); 2002. p. 259-86. Anninga JK, Picci P, Fiocco M, Kroon HM, Vanel D, Alberghini M, et al. Osteosarcoma of the hands and feet: A distinct clinico-pathological subgroup. Virchows Arch 2013;462:109-20. Chiodo WA, Cook KD. Pediatric heel pain. Clin Podiatr Med Surg 2010;27:355-67. Leithner A, Bodo K, Scheipl S, Radl R, Kastner N, Windhager R, et al. Two cases of calcaneal osteosarcomas presenting as aneurysmal bone cysts. Foot Ankle Int 2004;25:815-8. Chou LB, Malawer MM, Kollender Y, Wellborn CC. Prosthetic replacement for intramedullary calcaneal osteosarcoma: A case report. Foot Ankle Int 1998;19:411-5.